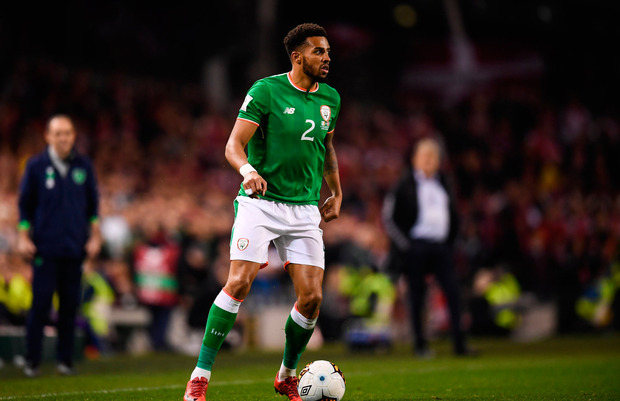 Cyrus Christie has condemned the racist comments he received on social media after Ireland's defeat to Denmark last week - and says it wasn't the first time that he has been on the end of such abuse during the campaign. Speaking at the PFAI awards last weekend, James McClean revealed that Christie was left in tears by a message that said he should go and play for Jamaica, and tonight the Derby defender broke his silence on the ugly abuse. In a statement released on social media, Christie said that it was 'deeply saddening' that racism is still prevalent in football, and urged people in the sport to stand up against bigots. "Firstly I'd like to say I am extremely proud to represent my country the Republic of Ireland and I give everything I can each time I put on the green shirt," he said. "I genuinely believe our fans are some of the best in the world. However, there have been a number of racist comments which have been brought to my attention during the World Cup qualifying campaign over the last couple of months and most recently last week. "It is deeply saddening that racism is still part of the game we all enjoy and love. I strongly believe we need to stand up against these individuals who do not belong in football or sport." The FAI subsequently referred the matter to the Gardai, who are currently investigating.